We are starting a special Blogging Marathon this month. When we did our mega Marathon during April, it was fun and no sooner we finished, there was a general wish to do it again. So we all took polls on what we might want to do and everybody settled with a theme to do ABC Cooking, meaning each day cook a dish starting with each letter. So this is going to be 26 days Marathon, each day dedicated to each letter from English Alphabets. What is BM without a twist right, so we made our lives, even more, harder, by picking up four themes that will have 6 posts for 3 themes and 1 theme with 8 posts. I knew it was going to be hard, so I didn’t want the themes to be fixed by week. However, there are some ardent and very creative bloggers like Vaishali, who has fixed her four weeks with each theme. There has been an enormous amount of off scene time spent on discussing and planning this mega marathon. I know I am going to enjoy it to the core, and I hope you will enjoy as well. The new change in this marathon will be the Linky tool that I am hosting for each day. So you will get to read the other participating blogs for each specific letter. It’s going to 25 bloggers doing this Mega Marathon and it’s going to be wonderful reading all of them. As you might know, fried dishes always have a special attachment. And when it comes to Indian Bread, Pooris, Luchis, and Baturas are my favourite. Of course not to mention Naan, Stuffed Parathas. Now you ask what I don’t like right, well I like and prefer rotis than rice. I love Baturas and my earliest memory of eating these beauties have been when Amma used to make for us on Sundays. A road down the memory lane, thinking about Baturas, gets me all nostalgic. Reading that post got me all teary, all those days came gushing forth, remembering the spinster life that vanishes before you even start to enjoy it. The good thing is, you still make baturas. Baturas are deep fried leavened flatbread made with Maida (All purpose flour), yogurt, baking soda and/or baking powder. As always reading about how this gets cooked is very interesting. 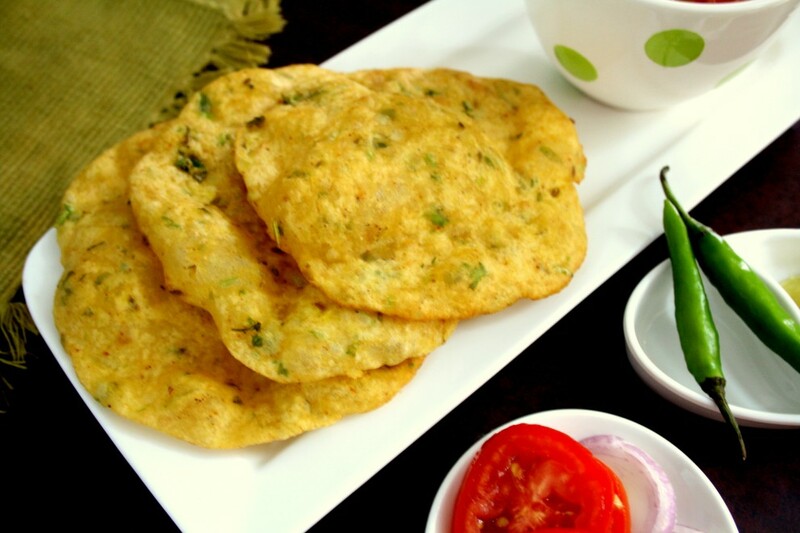 The leavening principle in making Bhatura, Kulcha, or American buttermilk-biscuit is same. The lactic acid in the yogurt reacts with baking soda to make dough light and rise. The baking powder helps continue the leavening during cooking. 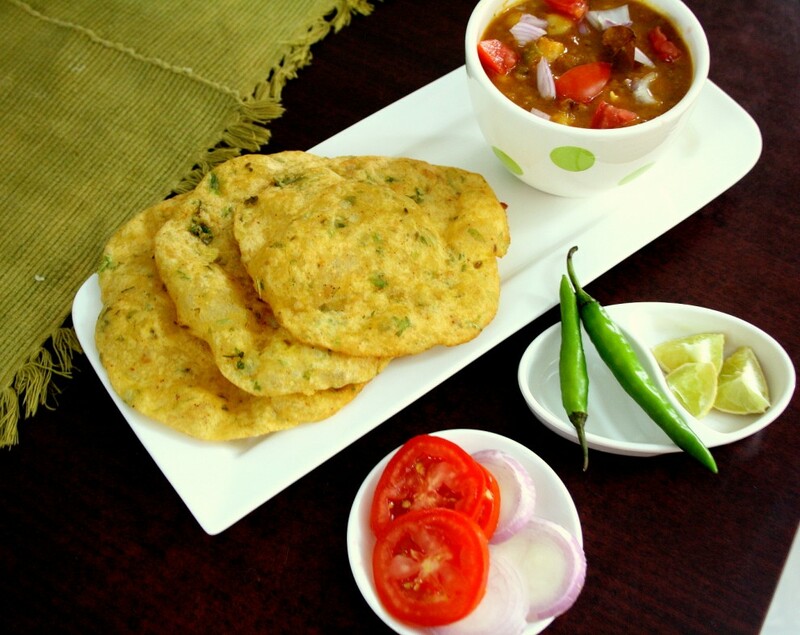 This deep-fried bread is supposed to have originated from Punjab, normally served with Channa Masala. Now this is so widely available in all parts of India, that one no longer differentiate this dish. The maximum I remember eating this has been during our many visits to Tirumala, where this is a very popular dish, be it for breakfast or dinner. However, in many restaurants in South, this is served for dinner. The sight that captures you most will be the size these baturas are made. And they stay puffed until it gets served to you. The moment of utter satisfaction comes when you hurriedly poke your finger in the middle and hot steam scalds your finger! Of course, everything forgotten the moment you tear a piece away and dip it gingerly into piping hot Chana masala. Aaww…the taste surely takes you to heaven. So imagine combining two types of things that make up a fantasy, at least for a foodie like me. I love Aloo paratha and batura. Blending the aloo into the batura was ultimate. Not just plain, this recipe calls for the masala to be blended. The recipe is from my paper cutting filed up from The Hindu. This particular cook had shared many such interesting and tasty dishes. I implore you to try these. MW the potatoes for 4 -5 mins, to peel off the outer skin. In a bowl, take all the ingredients and mash down the potato. Mix everything together and slowly add water to knead into a soft, yet stiff dough. Divide into equal balls and keep it covered. Dust and roll out to discs as you do with your regular pooris. Heat a Kadai with oil for frying and gently drop in the rolled out baturas and cook until golden brown. As these are stuffed, you have to be extra careful not to put too much pressure on the baturas, else they will not puff up. Also, the spice level can be increased accordingly. I saw that after frying the spice went down. Am an ardent fan of batura, and obviously aloo batura is my list since a long.. Well prepared and beautifully presented. Lovely Aloo bhatura , I am coming to your home to grab some..
My sunday brunch was chola bathura… Next timw will def try this aloo version too. Yay Valli! And so we start a month-long BM again! And this is such a fun recipe. How can alu go possibly wrong? And i too have fond memories of eating bhatura at a small shop in Gurgaon where i grew up.Looking forward to all the other recipes from your end! First I thot ths s something lik chole battura bt here u ve stuffed aloo into ur batturas…dats wonderful nd 68 rotis jst WOW! was so happy to come home to posts waiting for me to read and comment. so excited over this marathon. your photos came out super crystal clear and step by step photos make it look so easy! Aloo bhatura sounds so delicious. I wish I can have some of those right now. Ah and this BM will rock! One of my most favourite dish. Your aloo take on it sounds interesting. 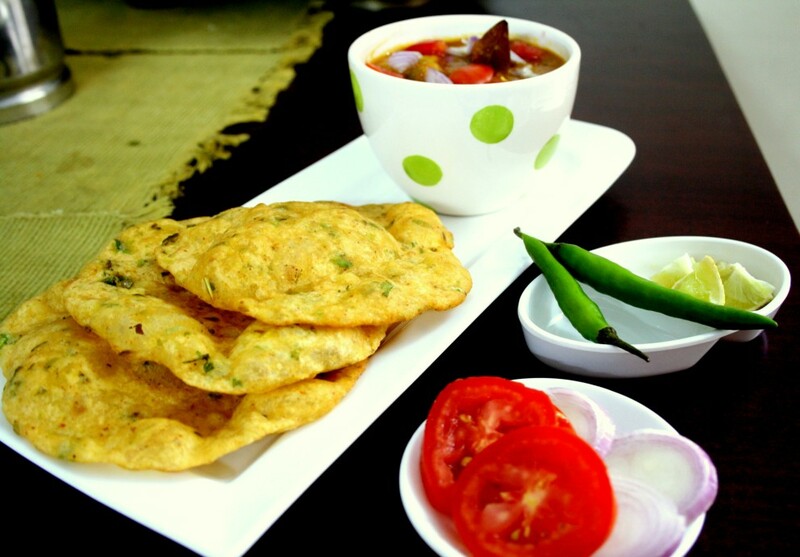 I am cravng to have bhatura, and here you have made these.. liked the aloo twist to the usual bhatura.. cant wait to try this out, or even better for someone to make this ! Aloo Batura looks very tasty n soft, will definitely be a hit recipe…. Love baturas!!! and adding aloo makes it even more tasty… a great start to the month long marathon!!! Addition of Aloo in Batura is interesting and the combo can never go wrong! A definite crowd pleaser!! Looks fantastic Valli. Nothing can go wrong with potato considering it is generally liked by everyone. Wow yum valli I never knew bhaturas can be made with potatoes got to try for sure love the yellow texture it got very nice. You nailed it when you said about poking into the puffed baturas they serve at the hotels!! The alu baturas look awesome and like Mireille said, the step by step clicks make it seem really doable. Yummyly made aloo batura.. Can never resist from not having one ..
That whole setting making me hungry wow..
My Kids favorite and there always a demand for it in my home..Love the whole platter.. I made these a couple of days ago and they turned out really yummy! My whole family loved it and I'll be making this again. Many thanks for kindly sharing the recipe. The photos are also very useful.